If you own a motorcycle and love to ride, you’re probably already aware of how swiftly catastrophic injury can occur. Regardless of how responsible and vigilant you are in the saddle, all it takes is just one wrong move from a distracted or negligent driver to cause a serious crash. 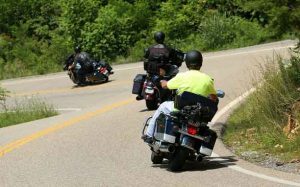 In 2015, more than 5,000 bikers were killed on our nation’s roads and highways, marking a 10 percent increase over the previous year. According to Consumer Reports, a combination of lax helmet laws, inexperienced and unskilled bikers and riding while intoxicated has generated this alarming spike in motorcycle fatalities. Despite the obvious hazards of operating a motorcycle, some bikers opt to forego appropriate protective gear or take other unnecessary risks. Here’s an overview of some little known facts and stats about motorcycle accidents that may help you stay safe and escape injury. In 2014, nearly 30 percent of all bikers who were involved in fatal crashes had a blood alcohol content above the legal limit. Nearly half of all motorcyclists have had ZERO formal safety training. Helmet use decreases the risk of dying in a motorcycle accident by 37 percent, reports the NHTSA. Nearly two-thirds of all motorcycle-vehicle accidents are due to another vehicle violating (unintentionally) the biker’s right of way. The majority of motorcycle accidents happen on short trips near the home, such as shopping, running errands, etc. Intersections are the most common site for motorcycle vehicle accidents in the U.S. The average motorcycle accident scenario offers bikers less than two seconds to use evasive maneuvers. Road hazards and defects such as potholes or uneven pavement account for less than 2 percent of all crashes. Lack of visibility is an issue: In many multiple vehicle accidents, motorists cite that they did not see the motorcyclist at all. Bikers aged between 20-29 and 50-59 are statistically more likely to be involved in a motorcycle accident. Motorcyclists who do not wear eye gear (to protect against flying debris, insects) are more likely to have a collision. In crashes involving single vehicles, nearly 70 percent are caused by biker error, such as over braking, excessive speed, or cornering too wide. In 2015, only 60 percent of fatally injured motorcycle drivers were wearing helmets at the time of their accident. Historically, motorcycle fatalities tend to peak in June and July, and are lowest in January-February. Helmets are 67 percent effective in preventing traumatic brain injury (TBI). Last year, motorcyclists represented a staggering 17% of all road deaths in California. Given their lack of visibility, stability and protection compared to motor vehicles, motorcycles will always be a riskier form of transportation. For more than two decades, Ellis Law Corporation has been advocating for motorcyclists harmed by negligent drivers. Our award-winning legal team has the skills and expertise to take on the most challenging of cases and secure full compensation for medical bills, lost wages, property damage and other losses. Call 310-641-3335 to schedule a free legal consultation with an experienced Los Angeles motorcycle accident lawyer.